Frontal radiograph of the left fibula head demonstrates a lucent lesion that contains the typical chondroid matrix calcification. Low-grade tumor. The imaging appearances of chondrosarcoma may overlap with those of other lesions, especially other cartilaginous tumors such as enchondroma. The presence of pain with any lesion (without a pathologic fracture in lesions of the hands and feet) is highly suggestive of malignancy. Other findings suggestive of malignancy in a cartilaginous tumor include endosteal cortical scalloping of more than two thirds of the thickness of the cortex, ill-defined border and/or zone of transition, and a large soft-tissue mass. Both benign and malignant cartilaginous tumors may show central lucency; however, lucency of an area that previously showed matrix calcification is highly suggestive of chondrosarcoma. Frontal radiograph of the left acetabulum demonstrates an expansile lucent lesion with no internal matrix calcification. Low-grade central tumor. Frontal radiograph of right side of upper abdomen demonstrates a destructive, expansile lesion of the 12th rib. The lesion contains irregular calcification. High-grade central tumor. 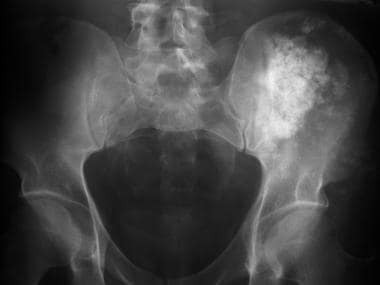 Frontal radiograph of the pelvis demonstrates extensive calcification overlying the left ilium and in the lateral soft tissues. No bone destruction is shown. High-grade secondary peripheral tumor. Lateral radiograph of the distal femur in a patient with hereditary multiple exostoses. 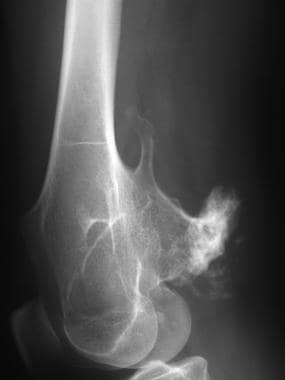 Several osteochondromas of varying appearances arise from the metaphyseal region; these typically grow away from the joint. 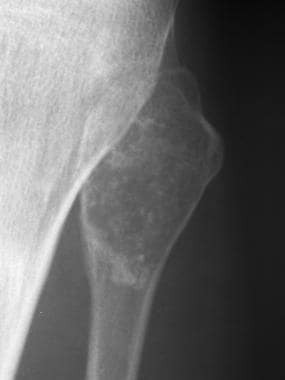 Soft-tissue calcification is shown overlying the most posterior osteochondroma. High-grade secondary peripheral tumor. The margin of intramedullary lesions is determined by the degree of aggression of the tumor. It is frequently ill defined. 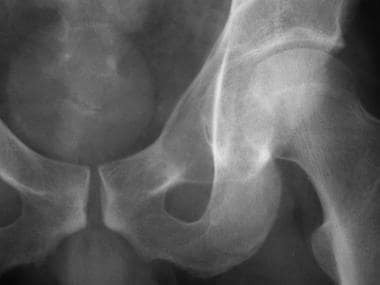 Endosteal scalloping may be present; when its depth is more than two thirds the normal thickness of the cortex, this scalloping is useful in distinguishing chondrosarcoma from enchondroma, except in lesions of the hands and feet. Benign enchondromas in these areas may cause considerable cortical thinning; such enchondromas may occur as a pathologic fracture. The presence of cortical destruction or a soft-tissue mass is indicative of malignancy. 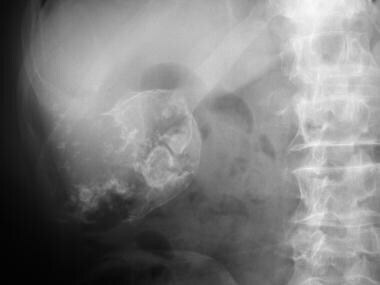 Destruction of matrix calcification that was previously visible in an enchondroma is indicative of malignant transformation. Radiographs alone are often inadequate for assessing the size of the tumor; MRI is useful for demonstrating both the intramedullary extension and the soft-tissue extension of the lesion. CT scanning may be helpful in identifying matrix calcification in some lesions that appear entirely lucent on radiographs. 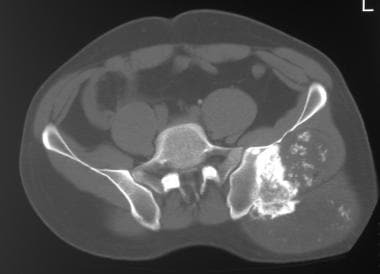 Bone-window CT scan of left acetabulum demonstrates matrix calcification in the expansile lucent lesion in the anterior column. Low-grade central tumor. 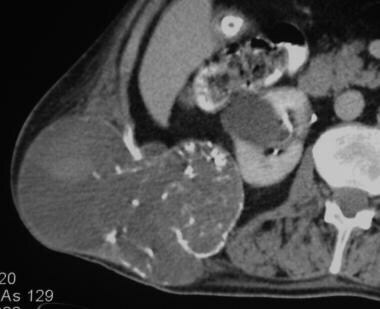 CT of the right side of the upper abdomen demonstrates the expansile tumor with a large, associated soft-tissue mass containing foci of calcification. High-grade central tumor. CT scan of the pelvis demonstrates a large soft-tissue mass that contains calcification arising from a broad-based sessile osteochondroma on the posterior aspect of the ilium. High-grade secondary peripheral tumor. 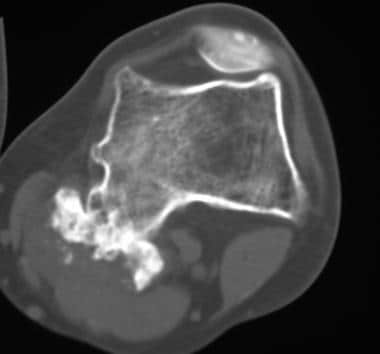 CT scan of the distal femur demonstrates a broad-based osteochondroma with a thick overlying soft-tissue cap that contains focal calcification. The metaphyseal contour is irregular because of the presence of several other osteochondromas in this patient with hereditary multiple exostoses. High-grade secondary peripheral tumor. CT scanning may be used to guide percutaneous biopsy, and it is the modality of choice for investigating possible pulmonary metastatic disease. CT scanning may often be used to successfully categorize the lesion as being of cartilaginous origin. The medullary extension of the lesion may be assessed more accurately with CT than with radiography. However, MRI is superior, and it is also the most useful modality for determining soft-tissue extension. 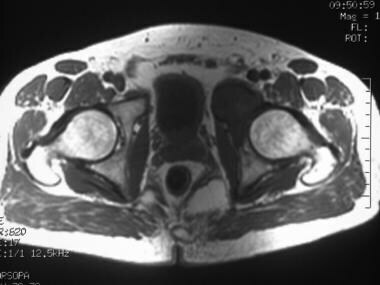 T2-weighted axial MRI of the pelvis demonstrates the high signal intensity of the acetabular lesion. Low-grade central tumor. T1-weighted axial MRI of the pelvis demonstrates the low signal intensity of the acetabular lesion. Low-grade central tumor. T2-weighted axial MRI of the pelvis demonstrates a lobulated high-signal-intensity soft tissue with local-signal-intensity septa arising from the osteochondroma on the posterior aspect of the ilium. Several areas of low signal intensity are shown; these correspond to focal areas of dense calcification. This appearance is typical of cartilaginous material. High-grade secondary peripheral tumor. Fast spin-echo T2-weighted axial MRI of the distal femur in a patient with hereditary multiple exostoses. 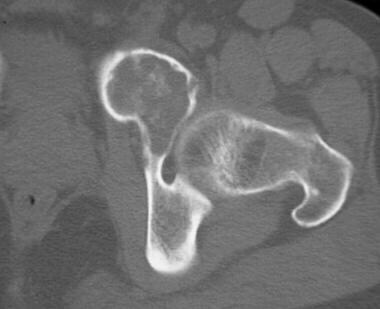 Image demonstrates the thick cartilage cap overlying a broad-based osteochondroma. Areas of focal reduced signal intensity in the cartilage cap correspond to foci of dense calcification. High-grade secondary peripheral tumor. Areas of matrix calcification are shown as signal voids on images obtained with all sequences, but small amounts of calcification may not be identifiable. MRI may demonstrate large aggregates of calcium, but tiny scattered calcifications may be completely missed because of partial-volume averaging. 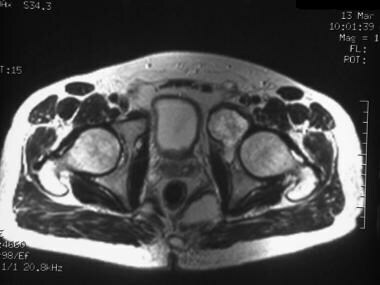 MRI may be used to assess soft-tissue extension and the intramedullary extent of the tumor. MRIs may demonstrate endosteal cortical scalloping, but this feature is more easily assessed with CT.
MRI is useful in assessing the thickness of the cartilage cap of osteochondromas to identify chondrosarcoma transformation. Chondrosarcomas show variable patterns of enhancement after the administration of contrast material. 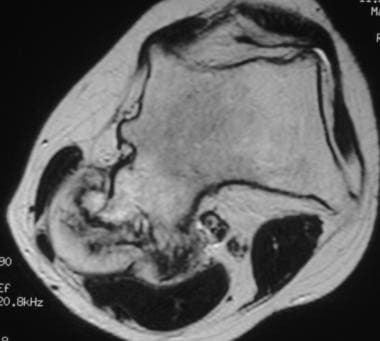 MRI is the method of choice for clarifying the intramedullary and extraosseous extension of a chondrosarcoma; features related to cortical bone and matrix calcification are more accurately assessed with CT.
Ultrasonography has no role in the evaluation of intramedullary lesions confined to the bone. It may demonstrate soft-tissue extension; therefore, it may be useful in guiding percutaneous biopsy. Ultrasonography is useful as a means of assessing the thickness of the cartilage cap overlying an osteochondroma, although access to the lesion may be difficult in certain areas. 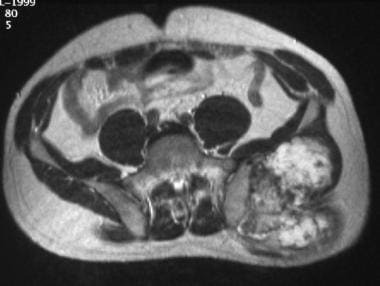 If the cap measures more than 1.5 cm in a skeletally mature patient, transformation to chondrosarcoma may have occurred. Marco RA, Gitelis S, Brebach GT, Healey JH. Cartilage tumors: evaluation and treatment. J Am Acad Orthop Surg. 2000 Sep-Oct. 8(5):292-304. [Medline]. Gelderblom H, Hogendoorn PC, Dijkstra SD, van Rijswijk CS, Krol AD, Taminiau AH, et al. The clinical approach towards chondrosarcoma. Oncologist. 2008 Mar. 13(3):320-9. [Medline]. Giuffrida AY, Burgueno JE, Koniaris LG, Gutierrez JC, Duncan R, Scully SP. Chondrosarcoma in the United States (1973 to 2003): an analysis of 2890 cases from the SEER database. J Bone Joint Surg Am. 2009 May. 91(5):1063-72. [Medline]. Langheinrich AC, Stolle C, Kampschulte M, Lommel D, Rau WS, Bassaly B. Diagnostic Value of Ex-Vivo Three-Dimensional Micro-Computed Tomography Imaging of Primary Nonhematopoietic Human Bone Tumors: Osteosarcoma versus Chondrosarcoma. Acta Radiol. 2008 Jul 11. 1-8. [Medline]. Murata H, Horie N, Matsui T, Akai T, Ueda H, Oshima Y, et al. Clinical usefulness of thallium-201 scintigraphy and magnetic resonance imaging in the diagnosis of chondromyxoid fibroma. Ann Nucl Med. 2008 Apr. 22(3):221-4. [Medline]. Müller U, Kubik-Huch RA, Ares C, Hug EB, Löw R, Valavanis A, et al. Is there a role for conventional MRI and MR diffusion-weighted imaging for distinction of skull base chordoma and chondrosarcoma?. Acta Radiol. 2015 Feb 25. [Medline]. Kapoor N, Shinagare AB, Jagannathan JP, Shah SH, Krajewski KM, Hornick JL, et al. Clinical and radiologic features of extraskeletal myxoid chondrosarcoma including initial presentation, local recurrence, and metastases. Radiol Oncol. 2014 Sep. 48 (3):235-42. [Medline].